In the beginning of the year I enrolled in a cooking school, sponsored by Forks Over Knives and taught at the Rouxbe Cooking School online. Oh what I learned. I sharpened my knife skills, learned how to roast and sauté without oil and even invested in a veggie steamer. I am pretty sure that Mr. Beet enjoyed the class as well since he was able to eat my homework. I actually stopped eating canned tuna a few years ago when I learned that the major tuna companies have not been practicing the safest of catching techniques, and/or the tuna is processed in China and shipped over to the United States. I am a bigger fan of plant based salads anyway. Like this tuna-less tuna salad we made in class. 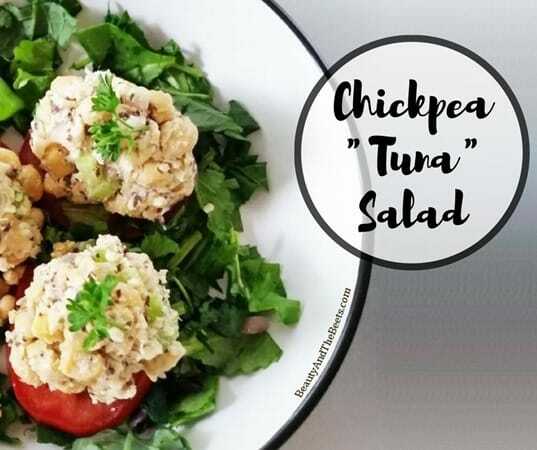 I used to be a huge fan of tuna growing up- especially mixed up with some relish and baked on a bun with some melted cheese. Yum. And then somehow through the years I have decided that I don’t like relish in tuna salad but like to add chickpeas. And then eventually I started to leave both the tuna and the pickles out of my “tuna” salad. And then I found a recipe from Rouxbe- the one thing they add that I was intrigued by was seaweed flakes. Something I did not know even existed, but now I am hooked on using them in almost everything. From Chickpea “Tuna” Salad to Caeser Salad Dressing, I think I may be keeping the seaweed flake business in operation. 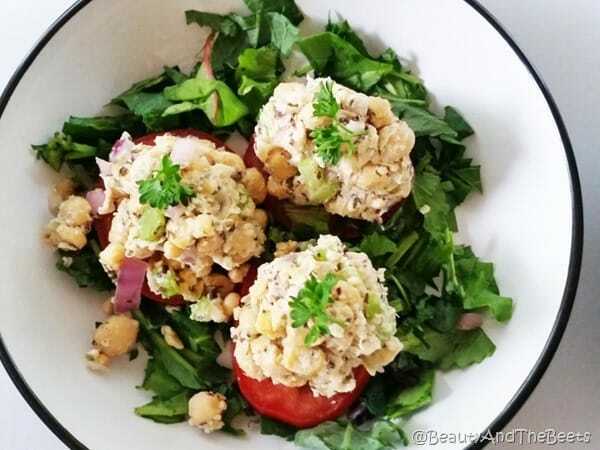 So I tweaked the recipe to my own liking, but of course however you fix your tuna- go for it. Add relish, or mustard, or use non-Vegan mayonnaise. Whatever floats your tuna boat- I hope you enjoy!! Based on the recipe from Rouxbe Cooking School. 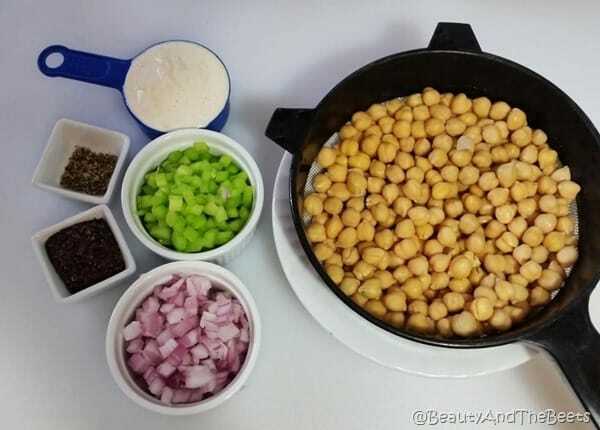 Add the chickpeas into a medium sized bowl. 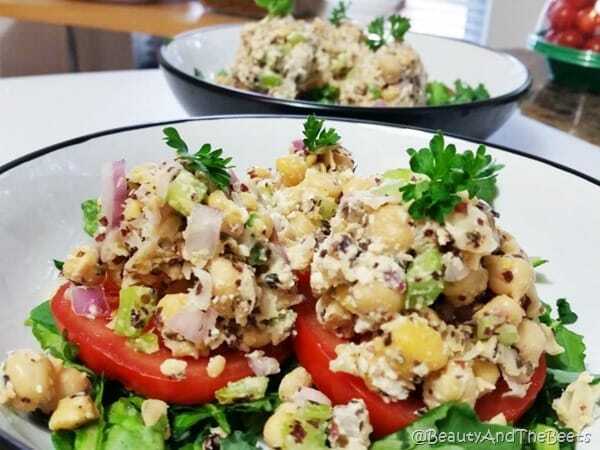 Using a potato or avocado masher, gently mash the chickpeas. 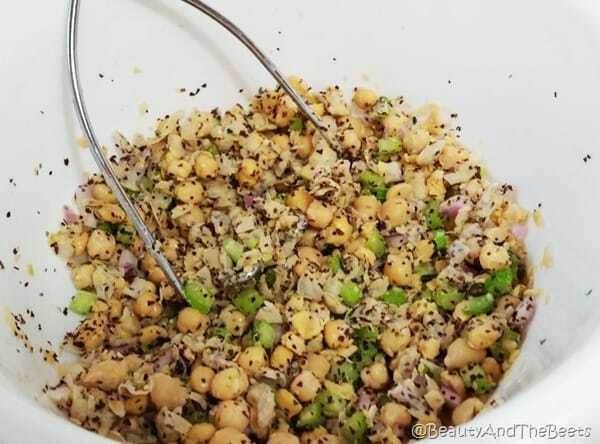 Do not overmash, leave the chickpeas slightly chunky. 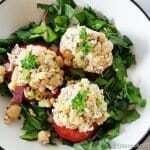 Fold the other ingredients into the chickpeas until combined. Serve immediately, on bread, crackers or over lettuce.